Creative FX are specialists in the London area at wrapping vehicles. Whether for commercial advertising or cosmetic reasons we’ll turn your car, van, bike, taxi, or coach into an eye turning work of art. We can apply any colour vinyl onto your vehicle in a matter of hours, all done by an expert team for a competitive price. Our expert, experienced team apply vehicle wraps using a specialist self-adhesive vinyl which is gently heated and then stretched over the car bodywork until perfect. The temperature of the material is monitored throughout with a laser thermometer. s like a respray and is guaranteed to draw admiring glances. Check our gallery for lots of beautiful images of our car wrapping work at our custom built body shop in Bromley, South East London. We can wrap any make or model or car like the Ford Focus or Mini but we also specialise in the wrapping of high end luxury cars such as Lamborghini, Porsche, Bentley, McLaren, Lotus, Range Rover. If you’re looking for a professional, high end car wrapping company in London give Creative FX a call today to see what we can do for your vehicle. We also wrap Vans, Bikes, Taxis and Coaches. If it can be resprayed we can wrap it for you! 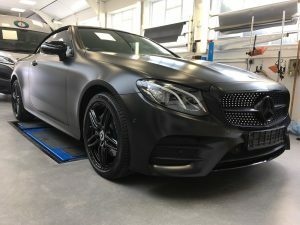 Based in Bromley we provide a car wrapping service to all London West London, East London, South East London areas including Lewisham, Wandsworth, Beckenham, Chislehurst, Orpington, Chelsea, Sevenoaks, Kent.